Communicating basic health information to children is often a difficult task. It can be particularly challenging with young children, as they know very little about their bodies and struggle to comprehend abstract or hypothetical reasoning. As children get older, they know more about their bodies and health, but talking about complex medical issues and health remains difficult. 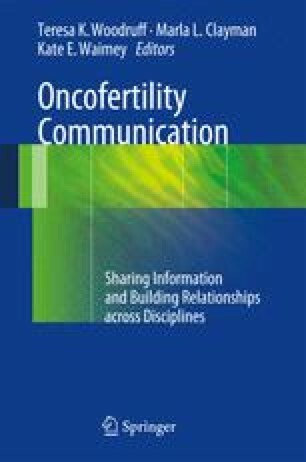 As oncofertility is a new field that lies at the intersection of oncology and fertility, communicating oncofertility information to children requires not only clear, developmentally appropriate explanations of both health- and medicine-related to cancer but also the discussion of sexuality, fertility, and reproduction. In this chapter, we provide a developmental perspective about what children already know about their bodies and reproductive systems, background on how media is used to communicate health messages to children, and recommendations for how oncofertility experts can use media to educate young audiences. This work was supported by the Oncofertility Consortium NIH 5UL1DE019587 and the Specialized Cooperative Centers Program in Reproduction and Infertility Research NIH U54HD076188. Sesame Workshop (n.d.). Kilimani Sesame Focuses on Malaria Prevention. http://supportus.sesameworkshop.org/site/c.nlI3IkNXJsE/b.4334103/k.3538/Kilimani_Sesame_Focuses_on_Malaria_Prevention.htm?auid = 3973718. Accessed 10 Dec 2012. GetWellNetwork. (n.d.). Client community. http://www.getwellnetwork.com/company/about-us/client-community. Accessed 23 Feb 2013.